The UWA Shenton Park Field Station wave flume refurbishment project is nearing completion. 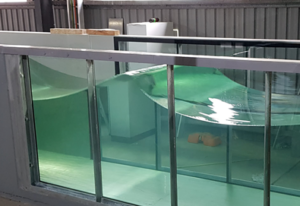 Once open, the facility will allow researchers to investigate the behaviour of fixed and floating structures when subject to either deep (offshore) or shallow (nearshore) water waves. This facility represents a significant increase in the testing capabilities of the offshore hydrodynamics team which will have a positive impact on research and teaching and allow us to provide further support to local industry. First cab off the rank will be a test program to support the Greenwater loading project undertaken by the Project 2: Wave Structure Interaction team. The refurbished Shenton Park wave flume completed essential commissioning works on the paddles supplied by HR Wallingford in late 2018. Video of the associated activities may be viewed here. Supplementary works on the overall facility are currently underway in order to make the wave flume ready for an official opening in early 2019. Stay tuned for news on the upcoming big splash!